This painting was finished about a week ago but I never really liked the background. So as any good artist will tell you, I couldn’t live with it & I painted it over. The background is a little less colorful and has less going on but I feel this showcases the Koi a bit more and doesn’t compete for the viewers attention. Like in any good play there can only be one star, The koi should be the star and the other parts of the painting should be subordinate to it. 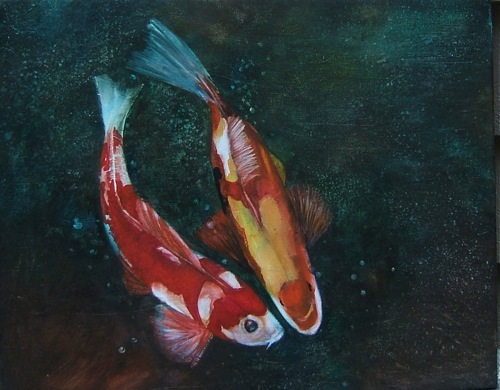 This entry was posted in landscapes, watercolor and tagged A painting a day, colored carp, fantasy fine art, Koi, shanti marie, water by shanti marie. Bookmark the permalink.